Comment choisir un dentiste à Londres - Comment choisir son dentiste à Londres quand le choix est si vaste? Many restaurants and bars in London have chosen to embrace Bastille Day and help celebrate this yearly event in style. This is not going to be any old Bastillle Day celebration; this is the day before the World Cup finale when France is to face Croatia. The French team is hoping to emulate their success of 1998 when they became world champions. 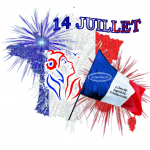 Spirits will run high and this is banned to be one of the most exciting Bastille Day ever. Morton's (Mayfair): Cocktail party and tricolour dress code. Let's not forget pereformance by French singer Anna Scott and al Fresco dinner on the balcony. La Poule au Pot (Ebury Street SW1): Cocktails renamed in homage to "the sans culottes"
Neptune (Bloomsbury): This amazing restaurant has teamed up with Citadelle gin to offer a brunch "A la française". A bargain at £25! Le Pont de la Tour (SE1): Unlimited seafood, a glass of champagne and wine. Frenchie (Covent Garden): They have teamed up with FAIR to create some great Bastille Day cocktails. L'Ami Malo (Spitafields): This crêperie is giving a free glass of wine or cider to anyone in Breton stripes or in red, white and blue. Little Social (Mayfair): Servving an exclusive 3-course dinner. Orrery (Marylebone): A one-off Bastille Day dinner with Moet Chandon and Loads of delicious French wines and probably one of the finest cheese trolleys in London.